The thin viscosity product offers the fastest assembly time of 5 seconds and an initial cure speed of 3 seconds. 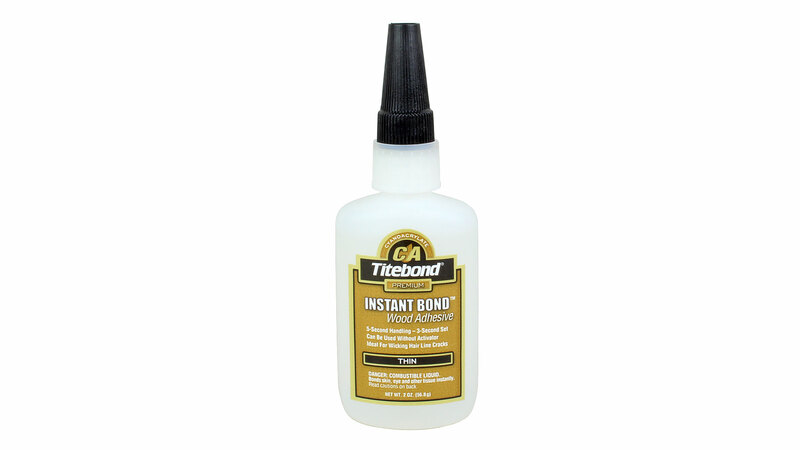 It is ideal for repairing hair line cracks and small defects in wood, as well as repairing loose veneer edges. It can also be used as a finish. While Titebond Instant Bond Activator can be used to further reduce set times, it is not required for producing strong, tight-fitting joints. Cure Speed: 5 second handling, 3 second set, 30 second cure. Full cure in 8 hours. 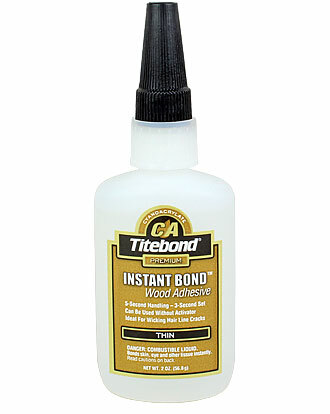 Titebond Instant Bond Wood Adhesive is not intended for exterior use or where moisture is likely. Store in a cool, dry place. Handling and set times may be affected by environmental conditions. 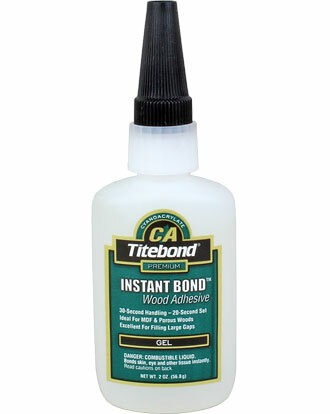 For best results, apply adhesive between 12°C and 29°C. KEEP FROM FREEZING. The thick viscosity product offers an assembly time of 10 seconds and an initial cure speed of 8 seconds. It is ideal for bonding end-grain in a miter joint application, quick assembly of jigs and fixtures, adhering turning blocks to scrap blocks on a faceplate for immediate use. Cure Speed: 10 second handling, 8 second set, 30 second cure. Full cure in 8 hours. The gel viscosity product offers the longest assembly time of 30 seconds and an initial cure speed of 20 seconds. It is ideal for gap-filling applications, gluing porous and odd-shaped surfaces and various cabinet making applications, such as pre-bonding moldings to install as one unit. Cure Speed: 30 second handling, 20 second set, 60 second cure. Full cure in 8 hours.